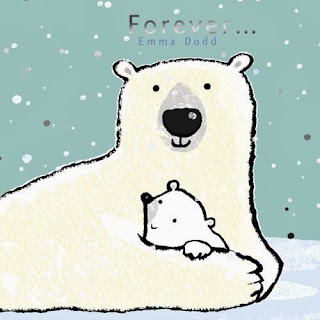 Forever is a beautiful, sweet book, perfect for winter! The art is stunning and yet simple. And the story is as well. I'll be right beside you. know that I will find you. This book can be used as a bedtime story. Or as a comfort to calm a wide range of tot's fears. Getting lost. A divorce or a temporary absence in the family, perhaps due to military service. And in view of the polar bear characters, it could even be used with a tot who has heard just enough to be confused about what global climate change means to her or him. Forever is not a traditional board book. The pages are paper. However, it's board book size, approximately 8"x8". I love the silver foil snow on the cover. This book is just so beautiful!